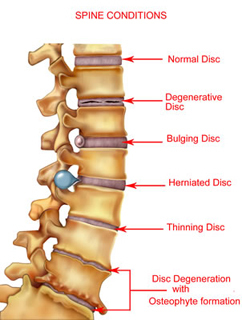 Obtaining a proper diagnosis of a back or neck injury or other back problems is critical and this usually requires an MRI or CT Scan because X-rays do not reveal nerve damage. 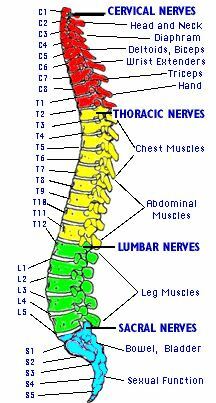 Complete Spinal Cord Injury: With a complete spinal cord injury there is usually a complete loss of sensation and motor ability - all movement is lost below the injury. Anterior cord syndrome: Damage to spinal cord which affects the ability to feel pain, temperature and touch, but often motor function is unaffected. Central Cord Syndrome: Damage affects ability to receive signals from the brain, sometimes causing paralysis,impairment in the arms and hands and to some extent the legs. Might also include loss of bladder control due to sensory loss below the injury. Brown-Sequard syndrome: Injury to the lateral half of the spinal cord characterized by anesthesia to pain and temperature, loss of propioception and motor paralysis below the injury. Spinal contusions: The most common type of spinal cord injury is bruising caused by inflamation and bleeding around the injury. Injuries to nerve cells: Loss of feeling and movement in the body corresponding to which nerve is involved.